Master Illusionist, Tristan Crist presents magic up-close and personal. Witness large illusions in an intimate setting, every seat is close to the action. 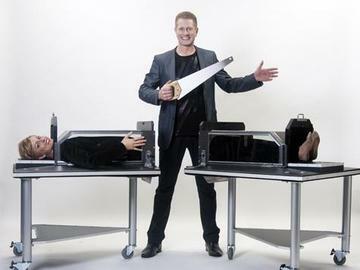 60 minutes of live magic, comedy and illusion to take place right before your eyes! Watch a lady get cut in halves, or levitate high into the air. A motorcycle appears in 2 seconds from impossible conditions, and Tristan Crist displays his sleight-of-hand artistry with close-up magic projected on a large screen. Audience members are invited to participate throughout the performance, and several even join Tristan on stage for some magical fun! The show comes to a thrilling end -You won't believe your eyes! The Tristan Crist Magic Theatre is fun for the entire family!